I'll be the first to say it, I'm a St. Patrick's Day Grinch. Something about adults forgetting that their college days are long behind them saddens me. I made the mistake of going downtown to do some shopping today and got swept up in the crowds of tourists hustling and bustling to see Chicago's famous green river. Just in case anyone was wondering, it turns green from a reaction with sewage. Despite all the green tu-tus and carnival hats, perhaps the most depressing thing I witnessed on the Red Line was a young woman decked out in her Sunday worsts, desperately slurping from a hole in the side of her Diet Coke can. I just wanted to take it and throw it away, baby it's a lost cause, no need to shotgun. After all that hullabaloo I decided to spend the rest of the day grocery shopping and baking. 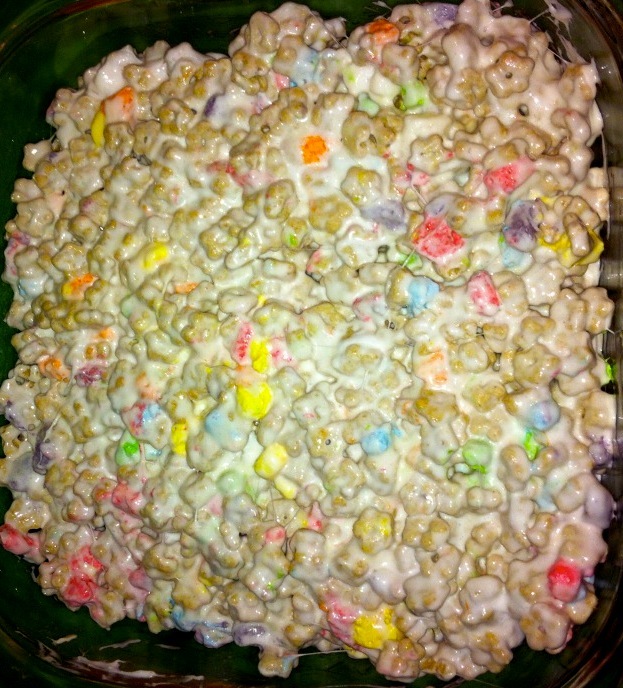 There's nothing drunk people love more than rice crispy treats, so I made these with Lucky Charms instead. Inspired by my favorite local doughnut shop, I've been wanting to make something festive that somehow incorporated Lucky Charms. The best I could come up with were crispy squares, so easy I'm almost ashamed to take credit for it, but I will. These literally took five minutes. Step 1: Grease pyrex pan with butter. Melt butter in a large pot with vanilla. 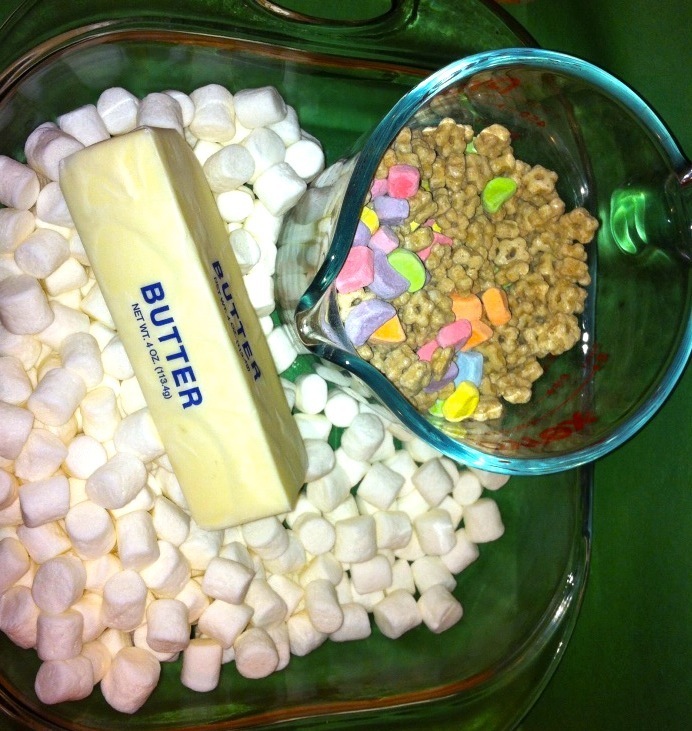 Step 2: Add marshmallows and melt with butter. Once melted, add cereal in small amounts. Remove from heat and mix thoroughly. Step 3: Push mixture into pyrex and press down with buttered hands. Allow to cool and then cut into squares. I made these a few hours ago and now they're gone.